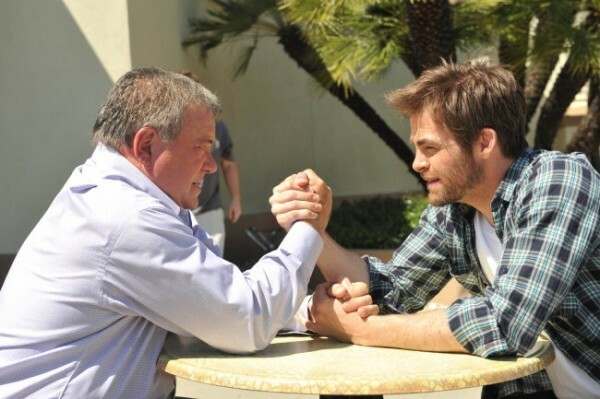 Photo of the Week: Kirk vs. Kirk! Frankly, we think the Shat should have challenged Pine to a “flying kick” competition. But maybe that’s just us. I’ve just finished the very hip book Ghost Radio by Leopoldo Gout. It’s a quirky and challenging novel with a seemingly well-paced story, but hiding a subtle and slow build. By the time I realised what was happening, it was almost done, even though all the clues are sown throughout the story. It’s told in episodic fashion, with snippets of radio interviews, flashbacks and with shifting points of view (at times I did find it tricky to know who the pronouns meant immediately). Each chapter begins with a haunting illustration that hints at what is to come. Thanks. Never get tired of reading stuff like this. We haven’t written much about GHOST RADIO lately. Probably because Leopoldo has been hiding in his secret underground base, teaching the demons to dance. The ending is a perfect horror ending. The story is resolved, Joaquin completes his quest, but the supernatural force is left completely open ended. In fact, the reader is left questioning what the truth is and what really happened to Joaquin. The implication is that the entire book was really just the story of one caller into Ghost Radio. Gout left me completely unsettled, and I loved it. I really liked the creepy uneasiness that permeated Ghost Radio. The book constantly has you questioning what is real and what is supernatural. The lines of reality are blurred and you believe everything (even the obviously supernatural events) is really happening. In this way, Gout’s book reminded me of Stephen King’s work. Like King, Gout is a storyteller first and foremost. Joe Hill’s collection of stories 20th Century Ghosts is also a great readalike for Ghost Radio. I wrote about reading this collection here (middle of the post) and suggest a few more readalikes. For the rabid Neil Gaiman fans out there (I am one of you), Gout should be a reliable new author for you to enjoy. Bentley Little also writes novels in which the real world and the supernatural collide in an unsettlingly realistic way. Try The House. The review is on the blog “RA For Everyone” run by a librarian named Becky. Hmm … librarians listen to audio books? Sigh. Another myth squashed. For the rest of the review click here. Audio: SF Site Raves About GHOST RADIO Audio Book! Ghost Radio is a definite must-read if you like spine-tingling books that will make you think. Check out all the Ghost Radio raves here. Do you like to read before you fall asleep? Don’t grab this book then unless you welcome a bout of fear-induced insomnia. Gout layers creepiness upon spookiness and broadcasts a good amount of uneasiness over his story until you, like his main character, Joachin, aren’t sure what’s real and what’s imagined. That will leave you with a nice unsettled feeling and a long wary look at the clock-radio near your bed. “Ghost Radio” is Gout’s first novel and I can’t wait for his next. If you want a book that will scare you, tune into this one. Check out all the Ghost Radio raves here!